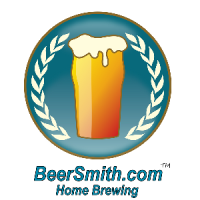 Today we released BeerSmith 2.1 and it is now available for download from our main site. Simultaneously we publicly launched the new BeerSmithRecipes.com recipe sharing site and cloud service. BeerSmith 2.1 includes a new recipe timer (open any recipe and click on the timer tab) which shows you step-by-step how to mash, steep and boil your recipe and also plays an alarm as each step is reached so you don’t miss anything. This makes it easy to use BeerSmith to keep track of your latest brewday. The other major enhancement is a new site called BeerSmithRecipes.com which is integrated with a new cloud folder feature in BeerSmith. BeerSmithRecipes.com is a large online repository for BeerSmith 2 recipes, both public and private. You can visit the site and search from hundreds (soon to be thousands) of recipes that others in the BeerSmith community have published. View Your Cloud Folder On the Go! If you set up a free basic account, you can view, download, bookmark and review all of these recipes. I’ve also built extensive social media functions in so you can find your friends online, follow what they are doing, view their public recipes, comment on their wall and review their recipes. I think the new site will also be a great resource for many homebrew clubs. Several have already contacted me about creating a club account for club members to follow where they can publish recipes for the club or organization. Next we come to the new cloud folder which is tightly integrated with BeerSmith 2.1 and BeerSmithRecipes.com. As I mentioned above, anyone can create a free basic account on the new site and participate there. You use that same account to log into your cloud folder within BeerSmith 2.1 (under View->Cloud). When you do, any recipes stored in your cloud folder are also stored online on the BeerSmithRecipes.com site. So you can upload or download recipes from right within BeerSmith by moving them to your cloud folder. 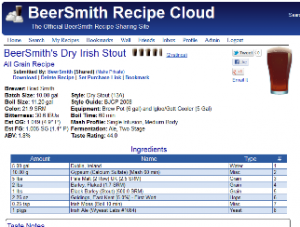 To upload a recipe you’ve created to BeerSmithRecipes.com, all you need to do is copy/paste that recipe over to your cloud folder within BeerSmith. It will be private by default, but you can also share it from there by clicking on the Shared/Private button on the ribbon. Once you have put a recipe in your cloud folder (either public or private) you can log into your BeerSmithRecipes.com account from any computer or mobile device and view your recipes there as well. This gives you instant access to your cloud recipes from anywhere – even on the go! I’m planning to start on mobile apps for BeerSmith shortly which will also use the cloud. Similarly if you find a recipe you like on BeerSmithRecipes.com all you need to do is to click on the link to make a private copy of it, and a copy of that recipe will be put in your cloud folder and will appear instantly in BeerSmith 2.1 the next time you click on the Refresh button from your cloud folder. So publishing or downloading recipes becomes child’s play. Finally, a lot of you wanted to be able to share your recipes across machines. BeerSmith 2.1 also gives you that feature as well. If you open your cloud folder on more than one machine you will see the same set of recipes, since they are all stored online. So you can move a recipe from your laptop to desktop by just copying it to the cloud folder and then going to the desktop and hitting the refresh button to grab the latest changes. We’re rapidly approaching 1000 public recipes (and some 2600 total) on the new site, and the community is growing fast (already over 1500 members). I hope you will take a few minutes to grab the new version, set up your free account and rate a few of your favorite recipes. The basic account does come with limited space, but you can easily upgrade to a Gold or higher level account starting at just over $1/month. We’re offering a substantial discount (over 30% off) new memberships here on the upgrade page. The sale will be open until the end of the National Homebrew Conference on 25 June – so join us now! Love the new update but tried to use the timer and well… it doesn’t make any sort of sound when it is done. Is there something I need to set? My computer sound was all away up. I am I missing something? The timer is there – make sure your sound is working with another app. I’ve tested it on all platforms. Which platform are you using?